Say it together, Sword of Moonlight: KING’S FIELD Making Tool is a mouthful! Spoken in its native Japanese you can toss in several more syllables and vowels between each pair of consonants. Try it… Sodo ovu Moonorito: Kingusu Fierudo Makingu Tsooru!! Arise Cthulhu arise! Ok, admitted – to the uninitiated this seems pretty nuts, like so many nonsensical gibberish Japanese RPG video game titles. Except in this case, believe it or not, there is a logic to it once the history is made a little bit familiar. If you have never heard of Sword of Moonlight you are not alone. 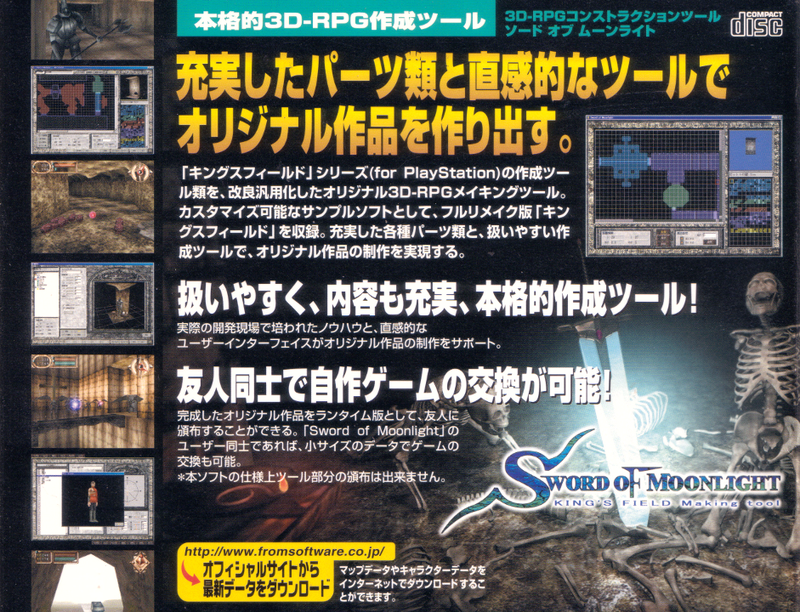 Spreading the gospel of Sword of Moonlight and its namesake KING’S FIELD is our mission here at Swordofmoonlight.net. It’s what we do and enjoy doing most, officially; shining the limelight on Sword of Moonlight so to speak, and so it was written!! Nowadays “Sword of Moonlight” has come to encompass many things which are all sort of the same thing if you can imagine that. Its destiny, the destiny of this site, the destiny of everyone involved and everything within are all pretty much inseparably intertwined at this point. And if this all seems a little too cosmic. Keep reading. So like it all began way back in the 90s with an unassuming game rather cryptically dubbed by its creators “King’s Field” (normally rendered in all caps) which mingled full-polygon, free-roaming, real-time, 3D first-person dungeon crawling and RPG elements. 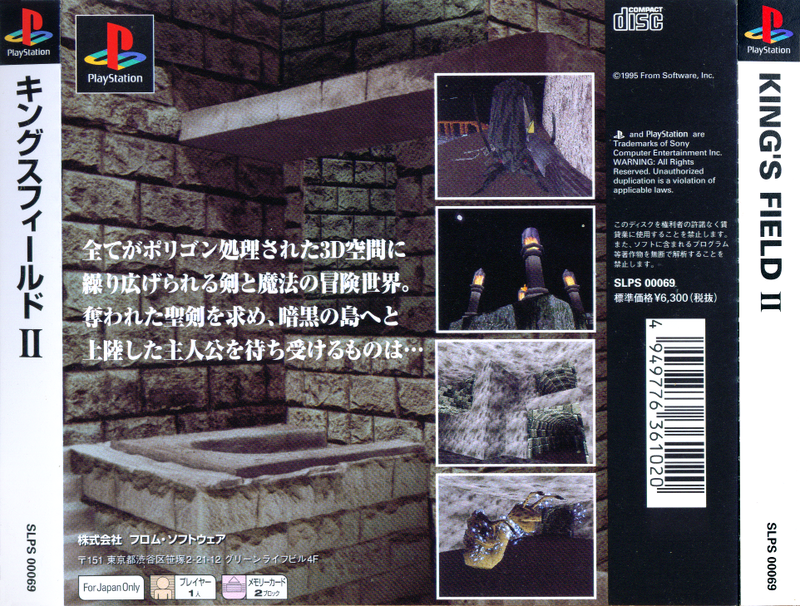 In fact the original KING’S FIELD released in Japan as part of the Sony PlayStation 1994 Christmas launch lineup looks like the first “recognizable modern 3D game” in commercial video game history! Whether or not historians will disagree on this point, we will probably never know if and when the creators in question, From Software, were ever availed of the distinction – we do know that Japan is world renowned for being modest to a fault. Published on Monday, July 4th, 2011. Reader responses and followups can be followed via the following RSS 2.0 feed. You can skip to the end and leave a response. Pinging is currently not allowed. If anyone can produce a good scan of this (http://vgmdb.net/db/assets/covers-medium/1/6/4/164-1155642007.jpg) card from the back of the KF 1 2 and 3 soundtrack case, I’d like to use it in the place of the second image on this page. Needs to be at least 480 pixels wide. Wider would be better for a close up. Lossless compression. UPDATE: Turns out the back of the Sword of Moonlight box set included the same graphic and is a much better fit because it includes the Som logo to boot!! Still interested in scans of the soundtrack btw!